Published on Thursday, December 28, 2017. Marjorie Schick, In Henri's Garden, 2003, painted paper, wood, canvas, plastic laminate and bronze, 27 x 27 x 9 in. Jewelry artist and ACC Fellow Marjorie Schick died on December 17, 2017. 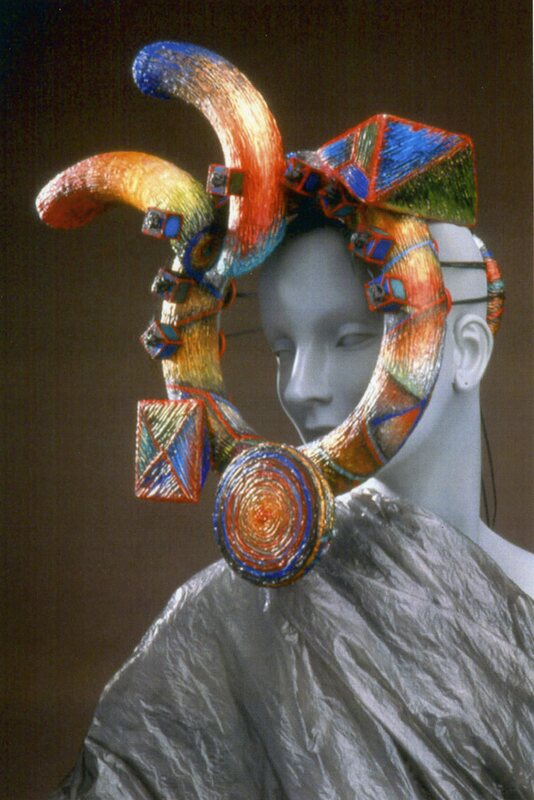 She was a pioneering force in avant-garde jewelry making, pushing body adornment into the realm of sculpture. Marjorie Schick was born in Taylorville, Illinois, in 1941 to Eleanor Krask, an art educator who filled her household with a wide variety of art materials and publications. Schick dreamed of becoming a fashion designer and took courses in watercolor, and fashion design, and illustration from the School of Art at the Art Institute of Chicago. She received her BS in art education from the University of Wisconsin, Madison, where she met her husband James B. M. Schick, a doctoral student in history. When she decided to pursue her MFA at Indiana University, it was James who advised her to apply to the jewelry program, noting her interest in the subject. In 1967, both Marjorie and James took faculty teaching positions at Pittsburg State University in Pittsburg, Kansas. Their professorships were two of the longest in PSU history. Although trained in the craft of metalsmithing, Schick was drawn to non-traditional media, from fiber and papier-mâché to the wooden dowels of her iconic Dowel-Stick Series. Throughout her body of work, Schick explored the relationship of sculptural form to the human body. She had a personal breakthrough after discovering the work of sculptor David Smith, wondering: What it would feel like to put an arm or head through the opening of one of his forms? “I view the human body as a living sculpture, and I am developing additional sculptures to be worn by it,” she said. She went on to merge her body sculptures with performance in “Choreographing the Object: An Evening of Visual Art and Dance.” Created decades earlier, these works seem to anticipate artists such as Nick Cave and his Soundsuits. Schick was a member of the Society of North American Goldsmiths. She received the 2002 Kansas Governor’s Arts Award, numerous awards as a faculty member of Pittsburg State University, and was inducted into the American Craft Council College of Fellows in 2000. She gave workshops and made guest-artist appearances at Haystack Mountain School of Crafts, Penland School of Crafts, Arrowmont School of Arts and Crafts, and the Cleveland Institute of Art, as well as programs in Norway, Nova Scotia, and Thailand. Her interview was included in the Archives of American Art Oral History Program at the Smithsonian Institution in 2004. Schick’s work can be found in the collections of many museums, such as the Victoria and Albert Museum in London, the National Museum of Modern Art in Kyoto, the Pinakothek der Moderne in Munich, the Philadelphia Museum of Art, and the Museum of Arts and Design in New York City. Marjorie Schick, Speak No Evil, 2001, papier-mâché, wood and cord, 16 x 13 x 5 in. Marjorie Schick, Head Sculpture, 1969, brass, bronze and plexiglas, 36 x 17 x 16 in. Marjorie Schick's head and body sculpture in dance performance of Choreographing the Object in 1978.